sin- had the most liked content! That data isn't in FAST. What to register my r32 as? On yor blue VIN plate a GTS4 will start with HNR32 and a GTS-T will start with HCR32. 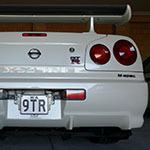 As above check GTR-Registry.com, put the HNR32-xxxxxx or HCR32-xxxxxx into the correct VIN table (or post it here). 6. There was 3408 produced (351 known manual coupes) and the ENR34 was available as the 25GT FOUR (sedan/coupe auto and manual), 25GT-X FOUR (sedan auto) and 25GT FOUR L Selection (sedan, auto or manual) You can see the differences in specs between these varieties here: Series 1 4 Door, 2 Door Series 2 (although there are no manual coupes) That's all I got. Why do people hate the R33? http://gtr-registry.com/en-r33-colours.php With links to all VIN with production information. ...? There was 180766 R33s built (16674 GT-R) and 67211 R34s built (11577 GT-R). Anyway the Japanese economy was significantly changing from the 80s to the 2000s. Simply saying there was less built therefore not very liked just isn't true as there are many other factors. OP thought the T in the model code meant Turbo but it means 25GT Turbo (GTT), GT-V. Car is listed as RB20DE. I've PM'd OP about this. I've spent a ridiculous amount of time ensuring everything is accurate so I want to check this out. Just sold... to you? If so congrats! That data isn't stored in Nissan FAST.